For your family ski vacation, you want a scenic, charming New England ski town in winter. Whether you choose to ski in Vermont, Maine or New Hampshire, there are some truly special ski towns in the East that give your ski trip that extra something, from sledding or cross country skiing, après ski shopping or visiting a ski museum, to beautiful lodging and local restaurants not far from the ski slopes. These top New England ski towns are fun on their own, with the addition of alpine skiing, so be ready for plenty to do in these pretty ski towns. Entering Jackson Village over the 1876 “honeymoon” covered bridge is your introduction to this winter snow globe. Cross country skiers glide across snowy fields. The Wildcat Tavern, Shannon Door Pub, and The Shovel Handle are humble but happening après ski eateries- family and local friendly. Jackson is quainter than North Conway but still well-positioned within 20 minutes of four ski areas: Black, Attitash, Cranmore and Wildcat. The Eagle Mountain House offers old-world hospitality just up the hill from Jackson village, along with great sledding hill, game room for the kids, and spectacular views of the White Mountains. Stowe Vermont is classic – Stowe ski resort rocks the Ski Capital of the East moniker, and the mountain town down the road may be the prettiest in ski country. Stowe’s Main Street draped in snow and sparkling lights offers views of Stowe’s slopes, inviting store fronts like Shaw’s General Store, and the beautiful church steeple (my husband and I were married here- so I am biased). Even if you stay slopeside at the posh Stowe Mountain Lodge, you should visit Stowe village and take the kids to the Vermont Ski Museum, some fun shopping and après ski (cocoas for the kids) at The Whip by the fireplace at the historic Green Mountain Inn. Manchester Vermont is the best of both worlds, a ski town steeped in history back to the revolutionary Green Mountain Boys, with cool restaurants and outlet shopping. From the Village Green, all covered in white in winter, you are an easy drive to Stratton or Bromley. Stratton Mountain Resort has plenty of terrain for your family, swift six-pack lifts and terrain parks, plus a Bavarian style pedestrian village with a signature clock tower. Bromley is an affordable fun smaller ski resort with a unique southern exposure -making it a sunny place to ski. The Mad River Valley is true Vermont, and the centerpiece of two very different ski areas – Sugarbush and Mad River Glen. The towns of Waitsfield and Warren offer timeless general stores, craft boutiques, covered bridges, organic pizza places where you can bring your kids and your pets, and pastoral scenery at every turn. Mad River Glen is like a ski museum with a classic single chair and earthy terrain, while Sugarbush’s two ski areas are more modern with big mountain skiing and slopeside condo lodging at Lincoln Peak. 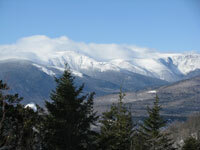 Ludlow Vermont is the hometown for Okemo Mountain Resort, on the National Historic Registry. Ludlow is indeed homey, folksy and fun. 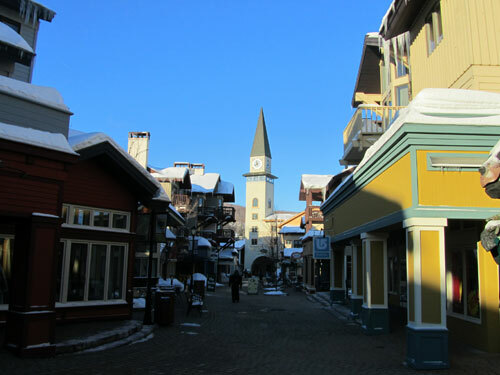 Main Street and Depot are lined with great home style restaurants, book stores, and ski shops. 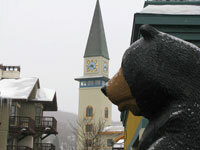 You can lodge by the slopes at Okemo Mountain Resort, or in a condo by the Castle – The Castle Hill Inn. Bethel calls itself Maine’s most b eautiful village, and in winter it is a humble happy place with just the right amount of craft shops, cafes from Irish, Asian, Italian, pizza to pub fare, Maine gems (we’re talking about tourmaline, not the natives), and a movie theatre. You’re ten minutes to the ski slopes of Sunday River or Mt Abram, and few decades from modern in Bethel Maine. Woodstock Vermont, while not slopeside, qualifies as a great ski town, for its beautiful parks, historic Rockefeller estate and Vermont craft shops – plus the signature covered bridge. Skiing is just minutes away at the original 1934 Suicide Six (you must take the kids to where Vermont skiing started), or a 20-mile drive to Killington’s ski lifts. The 1969 Woodstock Inn graces the Town Green, where you should go Nordic skiing, an après ski drink by the grand fireplace, or better – stay the night. Skiing families in Mass should check out Jiminy Peak in the beautiful Berkshires. With a well-designed Village Center, Children’s Learn to Ski and Ride Center, all-suite Country Inn lodging, and well-groomed terrain served by a six-pack chair, Jiminy Peak Resort in Massachusetts is a great ski weekend for young families south of the Vermont border.